ASYLBEK JEENBEKOV, Speaker of Parliament of Kyrgyzstan, condemned the provocative nature of the Innocence of Muslims video which denigrated Islam and the Prophet Mohammed, while also rejecting violence and the use of force against diplomats of any country. Noting that the world was changing as information spread faster, he said local events could have an impact on global processes. He expressed serious concern over the situation in Syria, and called for a quick end to the violence and the start of a broad political dialogue that would include all parties. He expressed concern over the situation in Afghanistan, and the emergence of various extremist and terrorist groups there, saying neighbouring countries had worked to foster investment, trade and communications ties with that country. Kyrgyzstan was helping to deliver supplies to Afghanistan through its cargo transit centre at the Manas International Airport. NATO and other forces partnering with Afghanistan must bring their work to fruition so that the country could take responsibility for its own security and stability, he stressed, adding that the international community must do its upmost to rehabilitate Afghanistan economically, including through joint socio-economic projects. Kyrgyzstan was doing its part by expanding economic and trade ties, and was poised to export electricity. Underscoring the need to eradicate opium production in Afghanistan, he said the deadly crop was harming neighbouring Asian countries, which were also becoming end-users. The opium trade spawned corruption, eroded State systems and led to crime. The international community must provide technical, economic and other forms of support to help Afghanistan and neighbouring Asian countries stem the drug trade, he said, emphasizing that the United Nations must be on the front line of efforts to tackle such challenges. 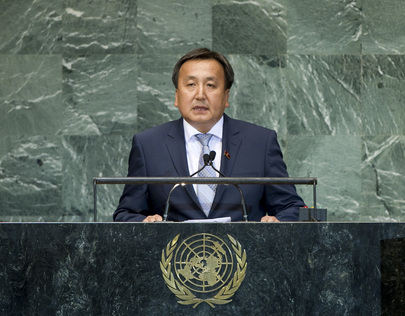 He also called for reforming the Security Council to make it more geographically representative, transparent and democratic, and for strengthening the coordinating role of the Economic and Social Council in sustainable development, food security, humanitarian aid, environmental cooperation and the Millennium Development Goals. Despite aid from global financial institutions, developing mountain States grappled with high foreign debt and transport costs, inhibiting their ability to achieve the Millennium Development Goals, he said, calling for United Nations support for his country’s efforts to ensure that its foreign debt was written off so it could carry out sustainable development projects. Since the April 2010 revolution, the country had worked to implement democratic governance and a parliamentary democracy, clamp down on corruption, including among senior Government officials, and prosecute organized criminals, he said, calling on Belarus to extradite former president Kurmanbek Bakiev and his brother Janysh. Since adopting a new constitution in 2011, Kyrgyzstan had set up a host of Government institutions and transparent mechanisms to select judges of the Supreme Court and other courts, he said. It was working with the Office of the United Nations High Commissioner for Refugees (UNHCR) and other global agencies to develop a just legal system. The country also needed international aid to tackle its high foreign debt and institute comprehensive reforms. Kyrgyzstan had a strong metallurgical industry, a skilled labour force in the energy sector, inexpensive electricity, and huge hydro-energy potential, he pointed out, noting that it had broken ground on one of most ambitious clean-electricity generation projects in Central Asia, which would supply potable water to neighbouring countries.